Home crayfish how to cook Yabbie soup recipe yabbie recipe How to cook Yabby? What is a Yabby or a Yabbie - a crayfish from fresh water. What I'm going to share with you today is my recipe version of Yabbies. The taste of Yabbies are similar to Prawn although Yabbies are not stronger taste than Prawns for those who haven't tasted them yet. 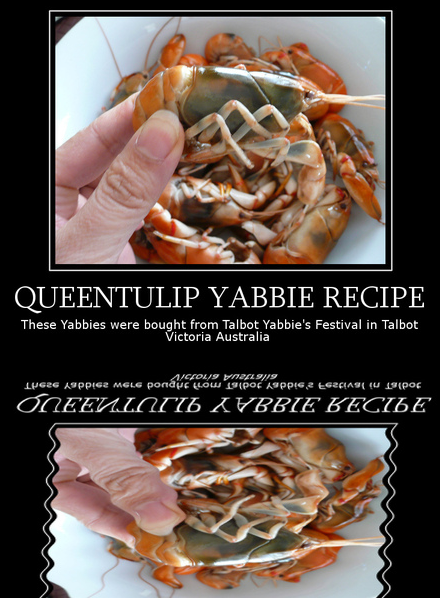 These Yabbies we bought and brought them from Talbot Farmer's Market in 2008 during their Yabbie's Festival. I think this is an annual event so you have the chance to go there and look for yourself if you live in Victoria. How I cooked to make it yummy is to use Tom Yum paste or any similar from scratch if you want. My measurements of the ingredients are only a guide depending on the weight or pieces of your Yabbies to cook. Saute it with garlic if you want. Best Serve with Cooked Rice in Asian style. Add your water for your soup and Tom Yum Paste before Button Mushroom. Quickly half cook veggies desired not overcooked especially Asian style. Aftermath for the cat...if your cat wants it though. An Asian twist on an Aussie classic. We almost invariably ate ours straight out of the pot with nothing added. Maybe another take on an Aussie classic would be a Yabbie Cocktail instead of Shrimp Cocktail. @Amateur Cook, I like your first line! :-) Thanks for sharing your thoughts, enjoy your blogging!